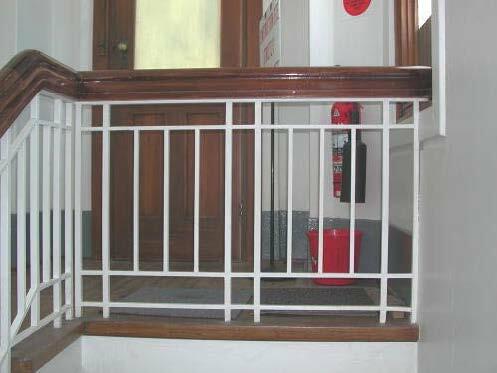 Click on each image to see the full photograph and read the full caption, illuminating the appropriate access design choices made in each image. 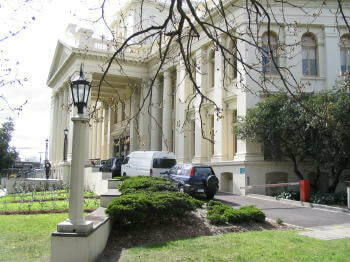 NATIONAL ARCHIVES, EAST BLOCK, ACT. 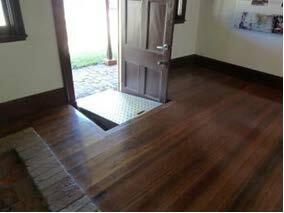 A new ramp incorporated into a new entry which reflects original details. 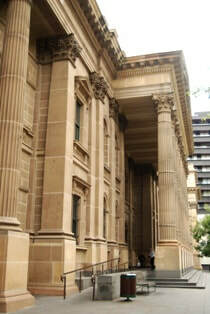 HISTORY MUSEUM, ADELAIDE, SA. Building with main steps at boundary. 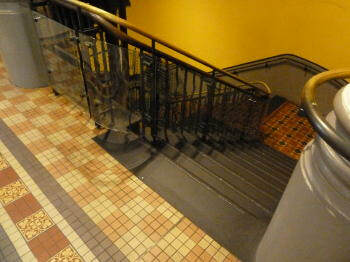 A platform lift has been added to an alternate entry which leads directly back to the main foyer. YARRALUMLA WOOLSHED, ACT. 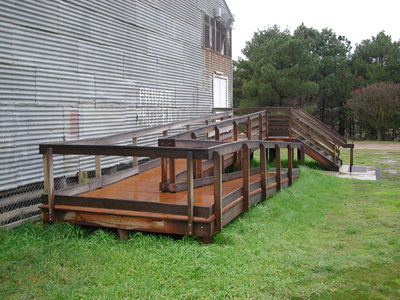 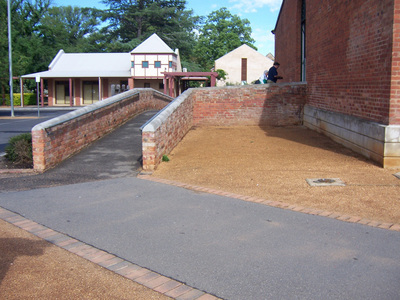 A new timber ramp added to provide access to the woolshed as it is widely used for public events. 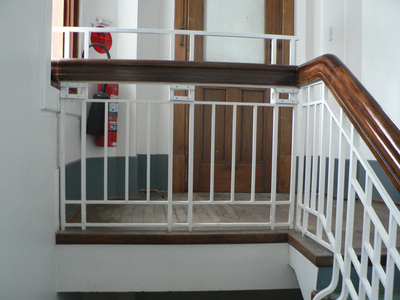 Timber details reflect the details of the building. 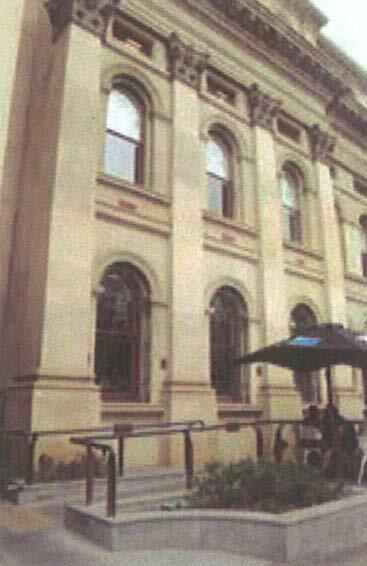 HOBART GOVERNMENT OFFICES, TAS. 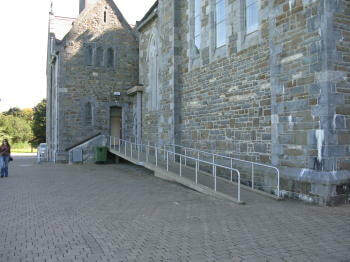 New ramp and steps added and parking provided close to the building entry. 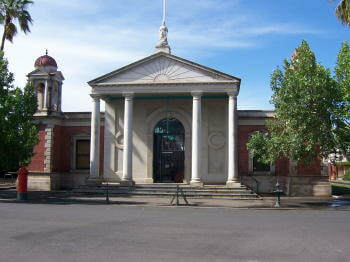 BENDIGO FORMER POST OFFICE, VIC. 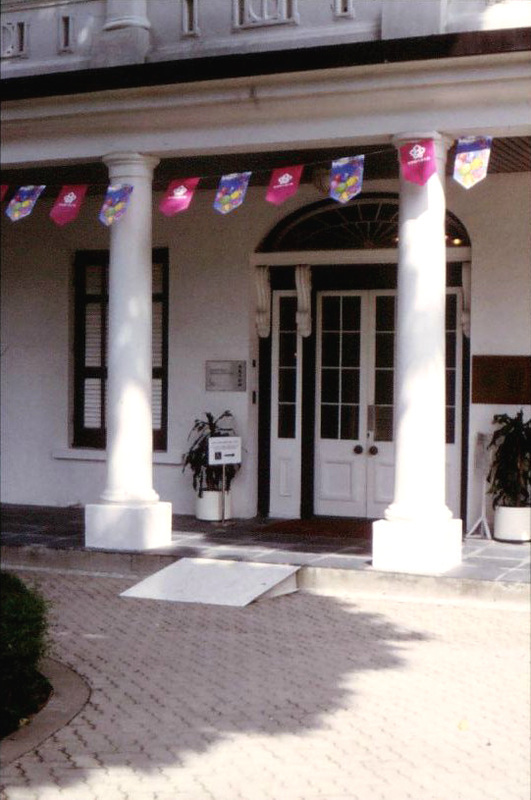 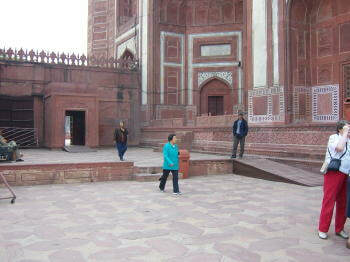 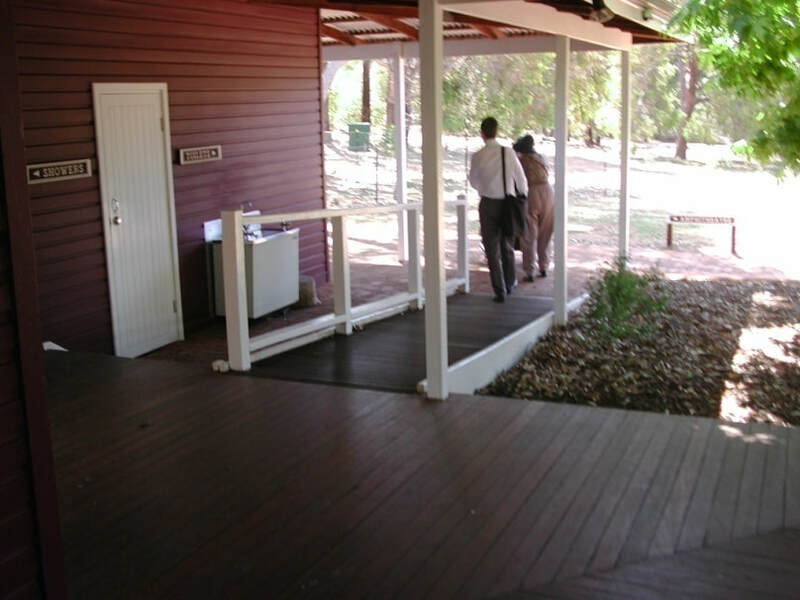 A ramp and landing added over the top of original tiled verandah to overcome the step to the entry. 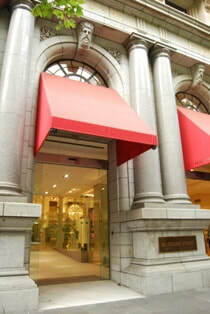 TEA MUSEUM, HONG KONG. 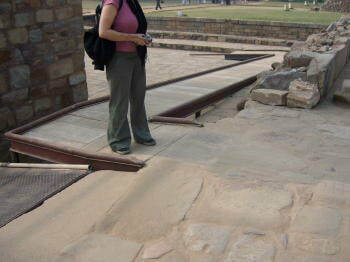 A temporary ramp overcomes the single step at the main entrance. 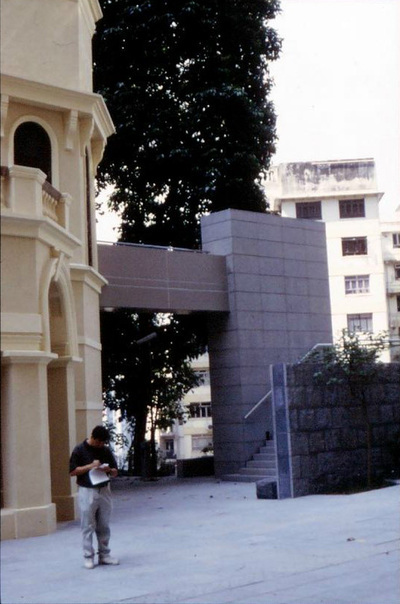 SYNAGOGUE, HONG KONG. 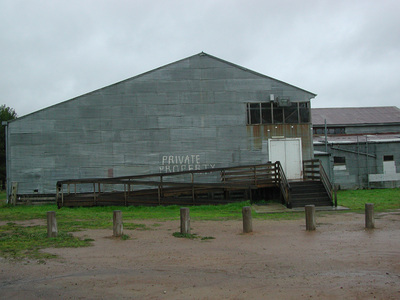 A new structure has been added separate from the building to incorporate a lift. 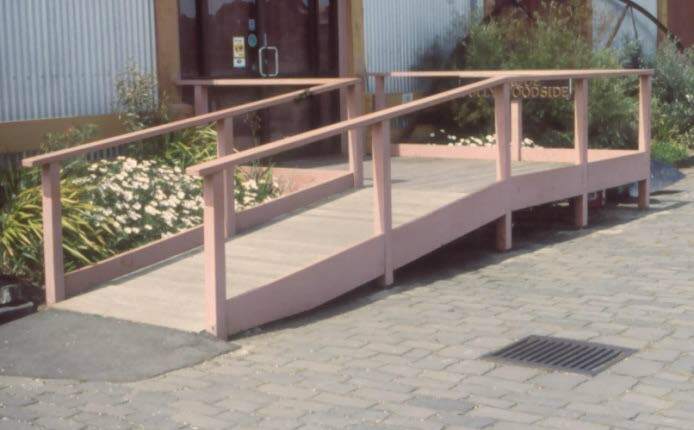 This with a bridge provides access to the upper level. 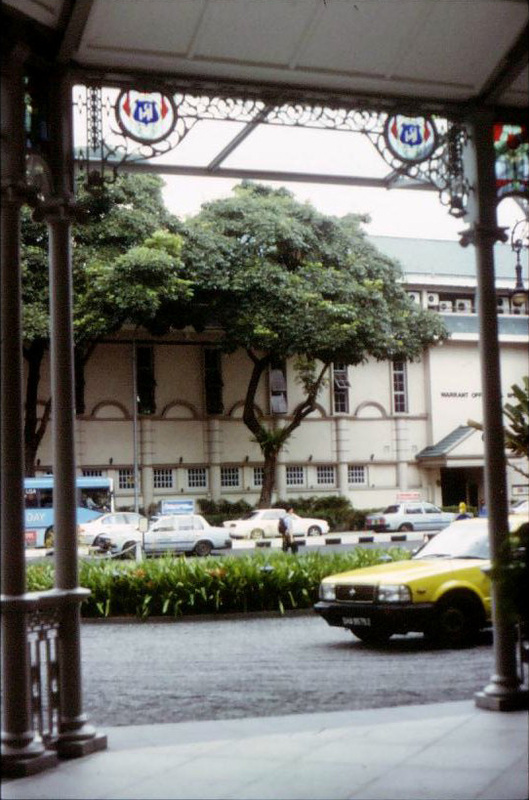 RAFFLES HOTEL, SINGAPORE. 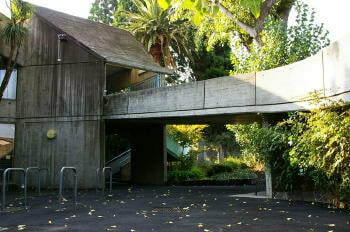 Driveway has been raised to provide on-grade access. 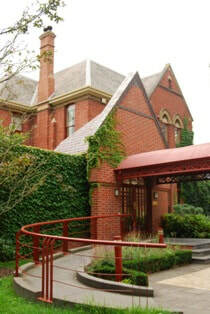 BENDIGO MUSEUM, VIC. 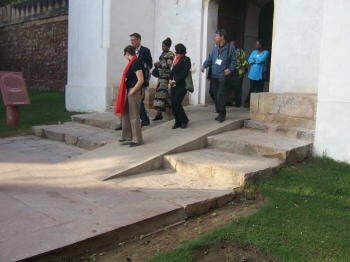 A new ramp added to overcome two steps at the entry. 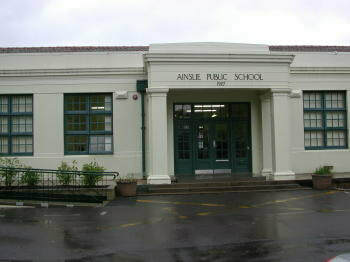 AINSLIE PUBLIC SCHOOL, ACT. 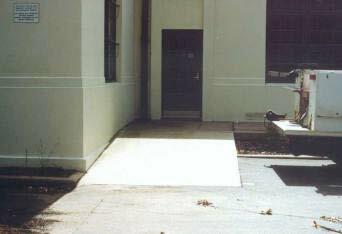 A new ramp and steps added to provide access to classrooms. 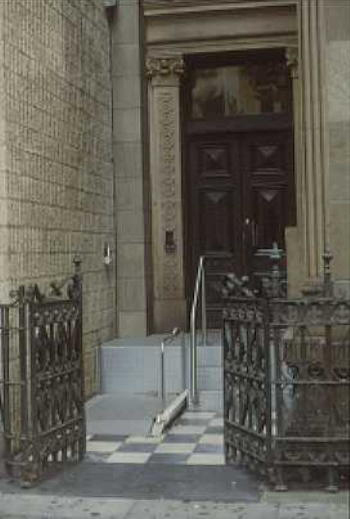 The double narrow doors are joined together for a wider door. 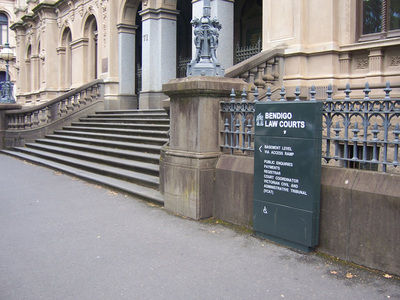 BENDIGO COURTHOUSE, VIC. 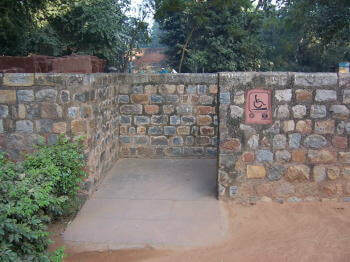 Signage to indicate an alternative entry as there are only steps to the main entry. 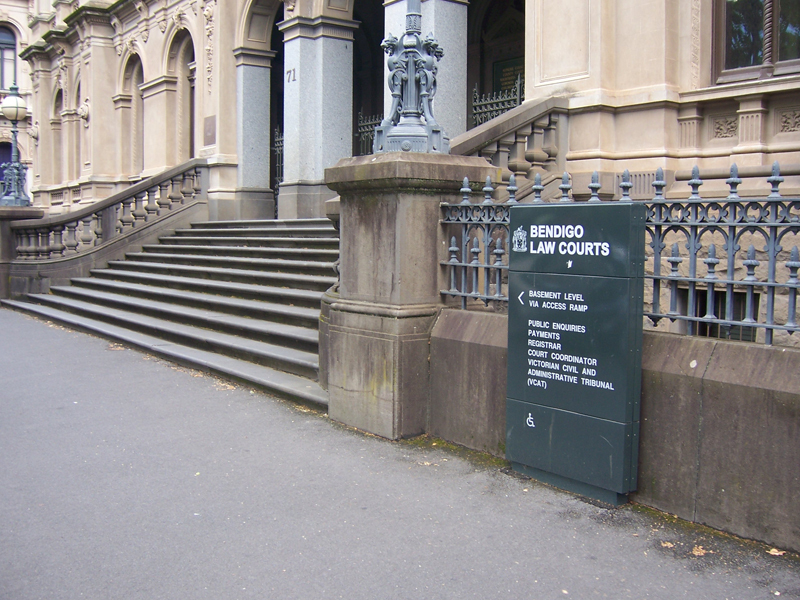 BENDIGO COURTHOUSE, VIC. 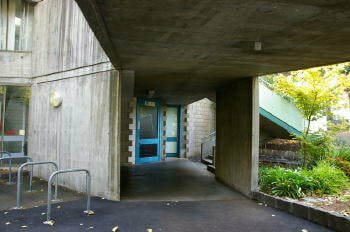 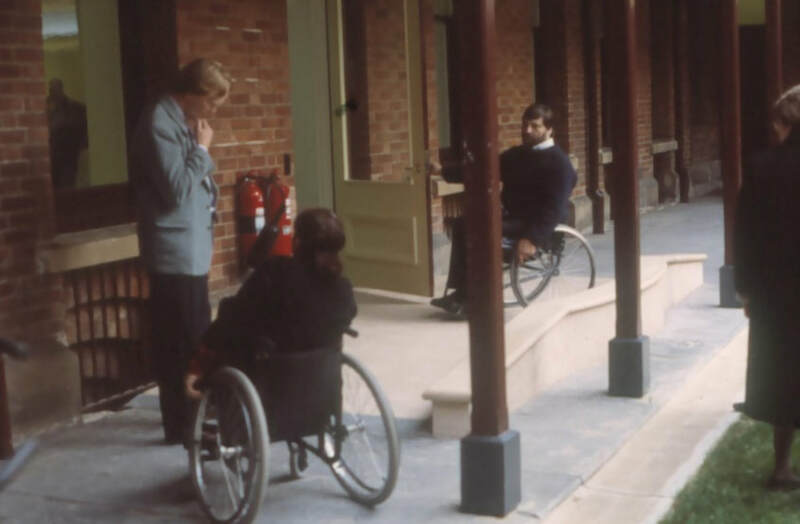 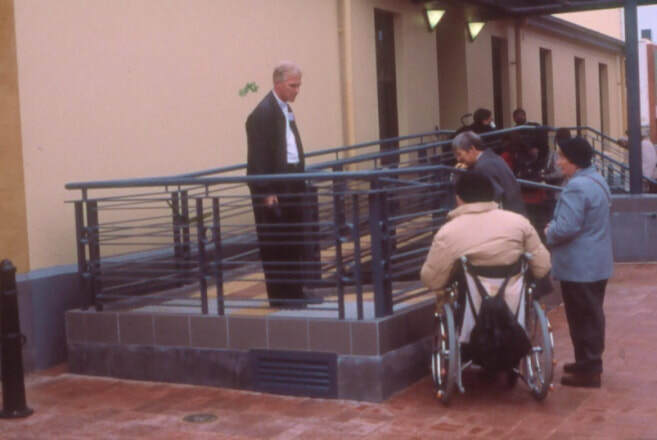 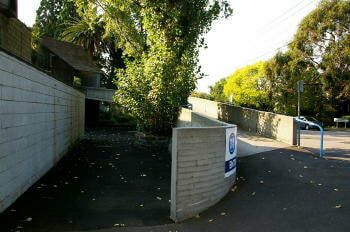 A new ramp incorporated into the void between the building and footpath which enables access to the building. 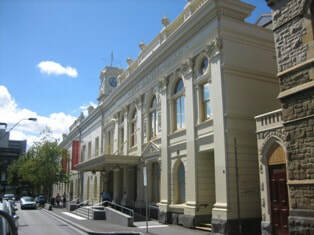 BENDIGO TOWN HALL, VIC. 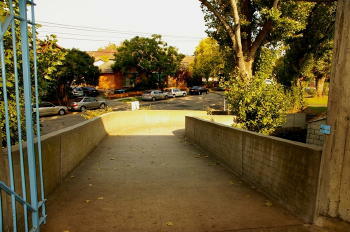 A new ramp added at the entry. 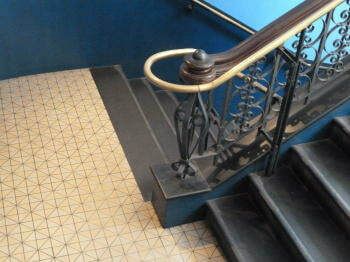 Details reflect the original. 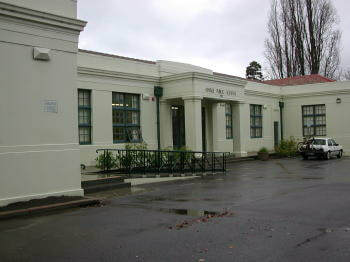 CASTLEMAIN MARKETS, VIC. 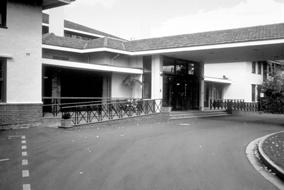 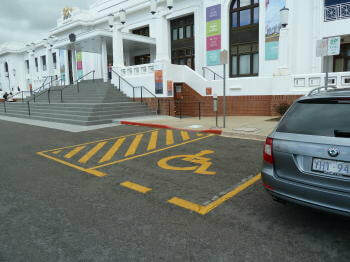 A new ramp provided to the main entry from the car park (not the original main formal entry). 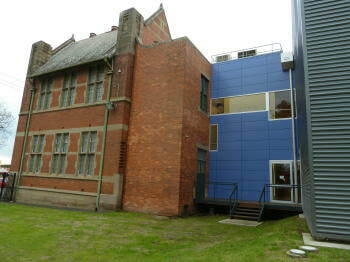 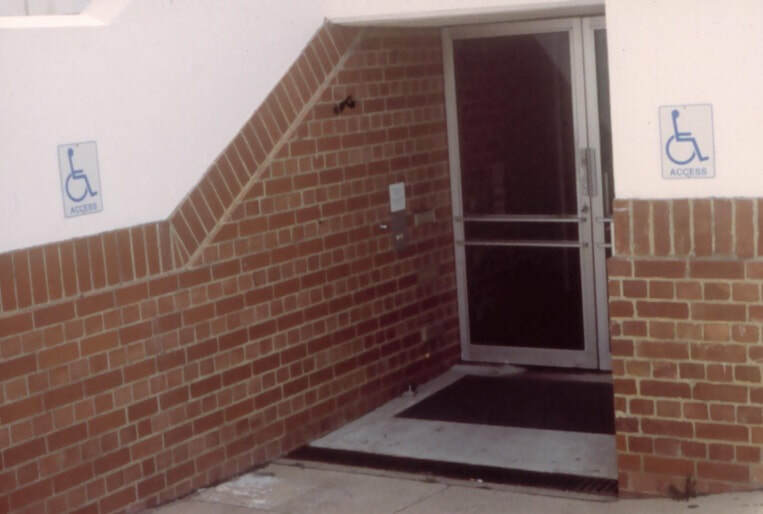 Ramp is separated from the building is symmetrical and uses bricks to match building. DUNTROON HOUSE, CANBERRA, ACT. 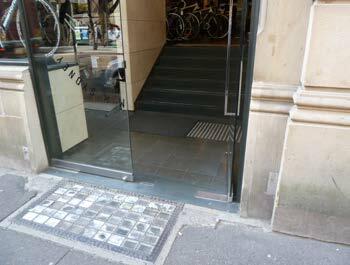 Flagstone paving is raised to overcome the step to entry. HOTEL KURRAJONG, CANBERRA, ACT. 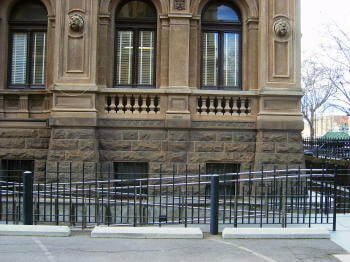 New ramps added to maintain symmetry and details reflect the original building. 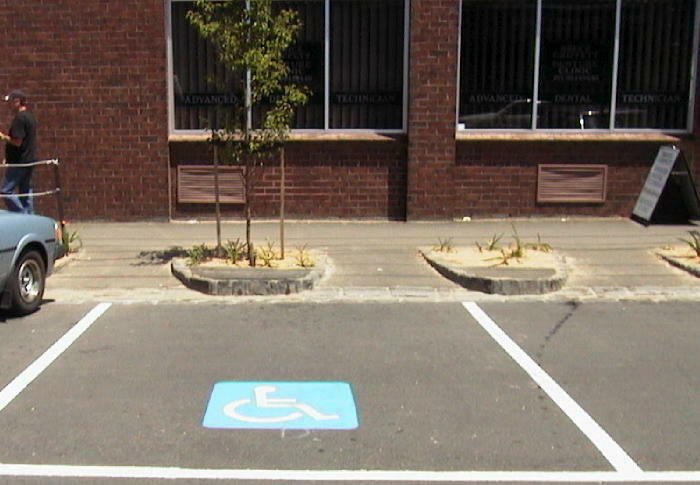 Car parking located adjacent ramps. 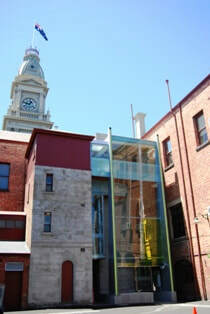 PORT ADELAIDE INFORMATION CENTRE, SA. 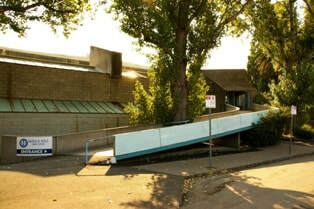 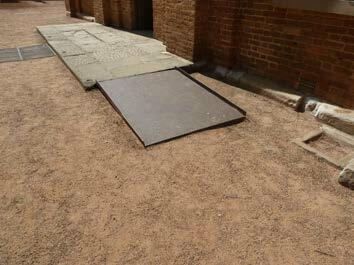 New ramp added to provide access to the entry. 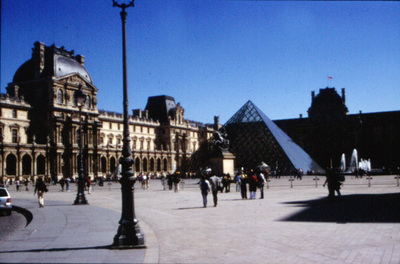 LOUVRE PYRAMID ENTRY, PARIS FRANCE. 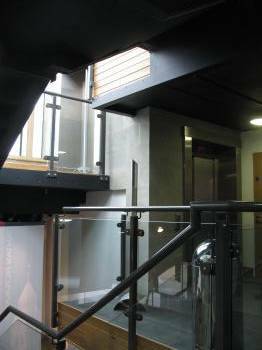 New dramatic entry provided which incorporates new accessible features. 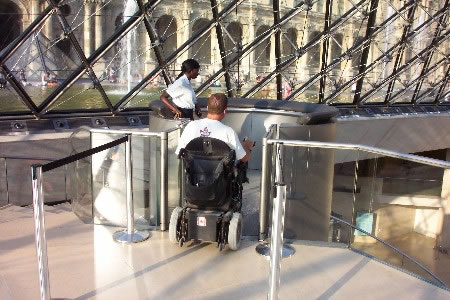 LOUVRE PYRAMID ENTRY, PARIS, FRANCE. 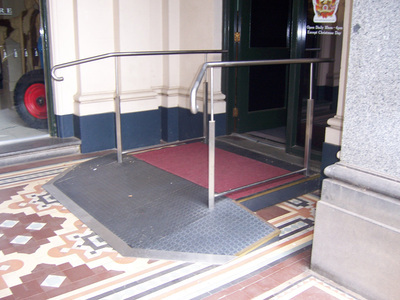 New dramatic entry provided which incorporates new accessible features. 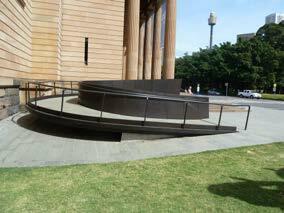 ABORIGINAL CULTURE CENTRE, ADELAIDE, SA. 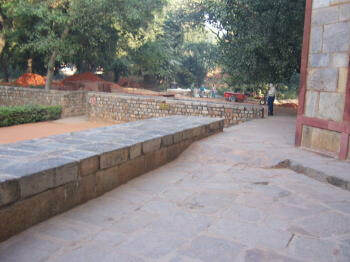 Part of the footpath has been used to incorporate a sloping path to overcome the steps at the entry. 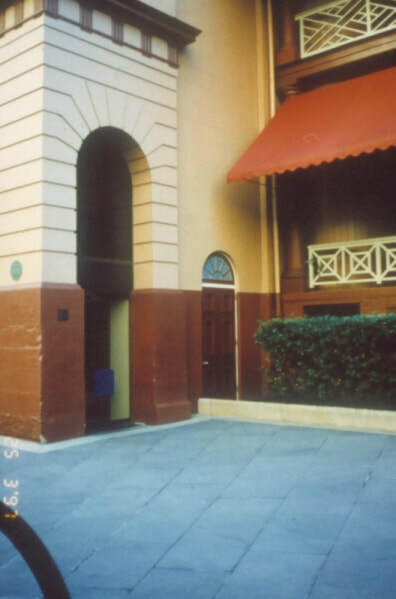 MELBOURNE GAOL, VIC. 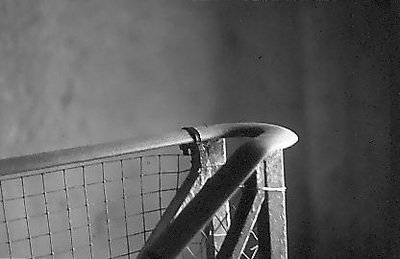 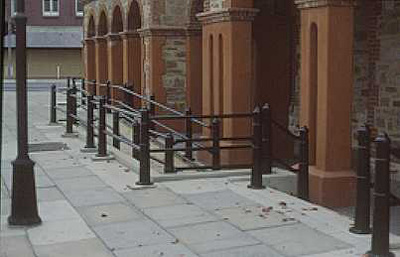 A tell tale plastic band indicates the end of the handrail and start of steps for visually impaired. 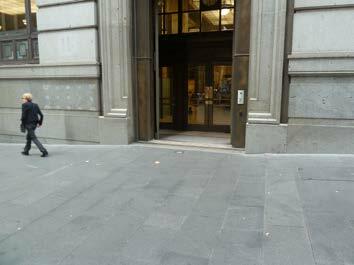 271 Collins St, Melbourne (DPCD) The entry has been modified as part of a retail redevelopment to remove the threshold step through the introduction of an internal ramp. 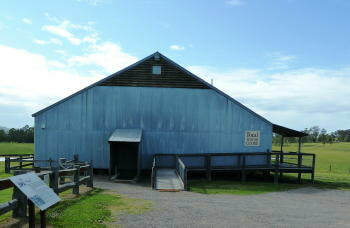 Belgenny Farm, NSW. 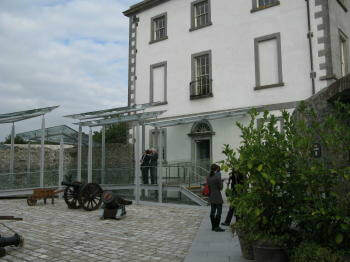 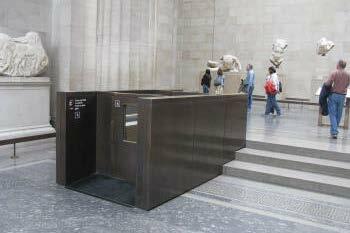 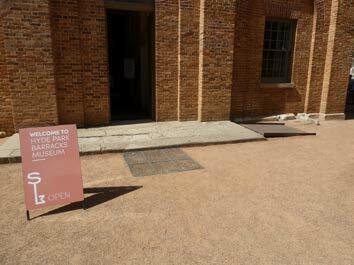 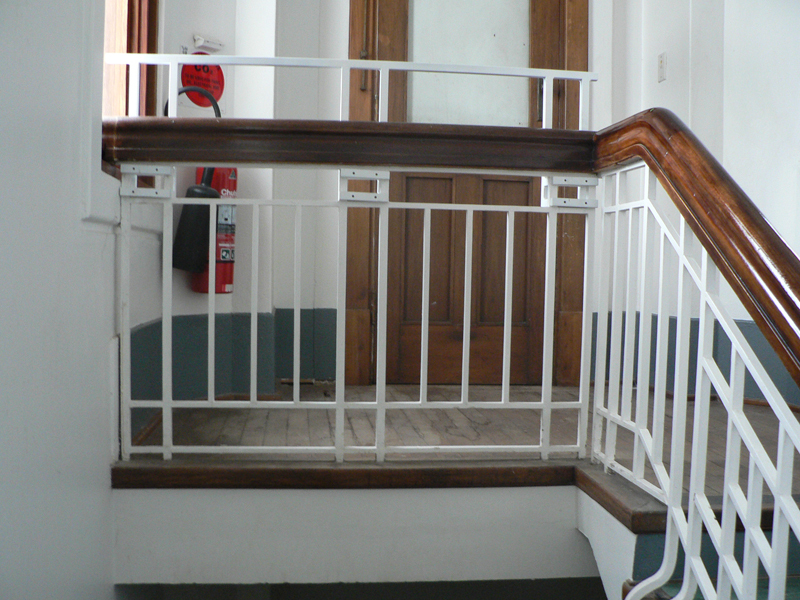 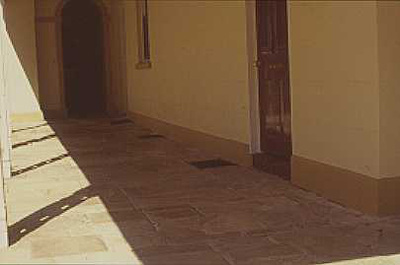 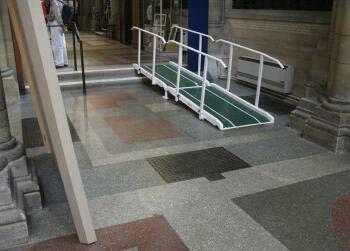 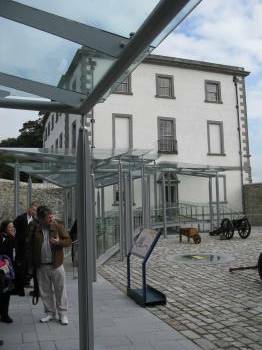 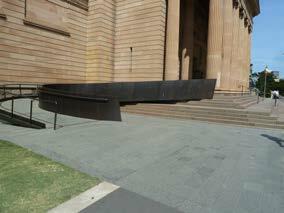 A light-weight portable ramp is used to overcome a step at the entrance, which is installed daily as the Museum opens. This solution requires management with staff and volunteers to install it daily. 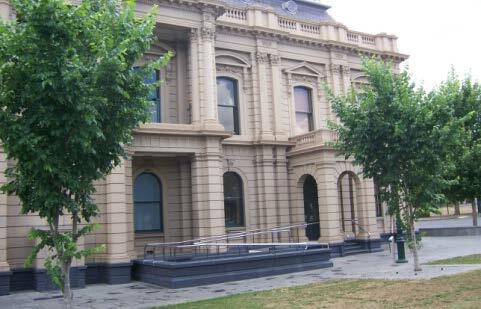 Bendigo Court House (DPCD) The main entrance is accessed by a ceremonial flight of steps that would be difficult to provide ramp access to. Access to an alternative entrance to the basement level is provided by a new ramp located in the void between the building and the pavement. 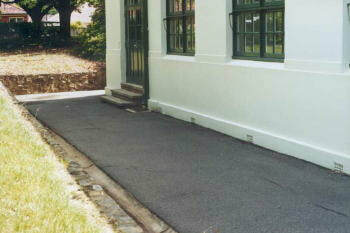 Former Collingwood Town Hall, Collingwood (DPCD) A new ramp constructed in bluestone has been crated within the portico to overcome a threshold at the main entrance. Former Prahan Town Hall, Prahan (DPCD) A natural change in level across the length of the building helps reduce the length of ramp required. 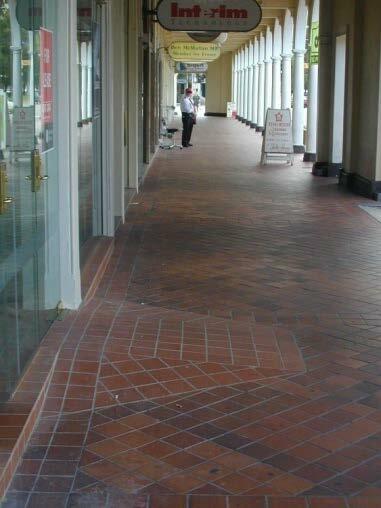 Former Metropolitan Meat Market, North Melbourne (DPCD) The bluestone paving has been re-laid to overcome the threshold at the kerb stone and provide ramped access for wheelchair users. 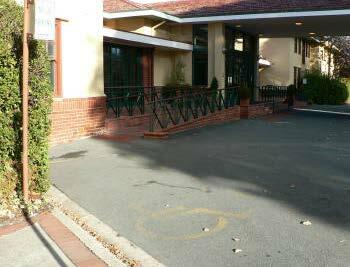 Hotel Kurrajong, Canberra (EMA) Accessible car parking spaces are provided next to ramp access without blocking access to the ramp for other users. 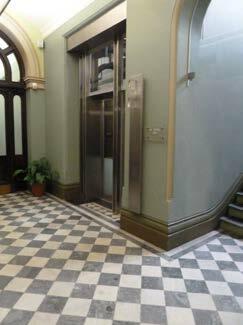 Orica (former ICI) House, Melbourne (DPCD) A sensitively designed platform lift has been integrated into foyer of this modernist office block at the side of the main en stairs. 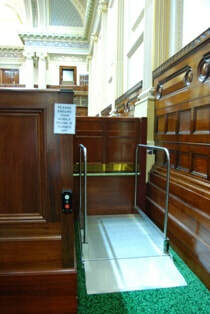 Parliament House, Melbourne (DPCD) An inconspicuous platform lift provides access to the public gallery. Prahan Town Hall, Prahan (DPCD) A high-quality reversible glazed ramp has been provided in the foyer to overcome a change in level. 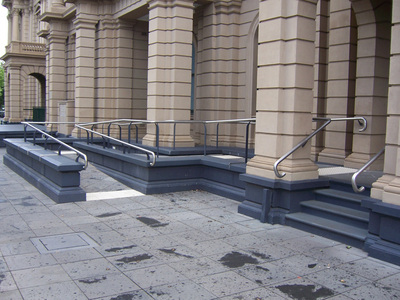 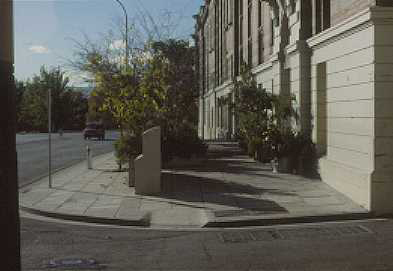 Former St Kilda Town Hall, St Kilda (DPCD) By keeping the gradient of the shared pedestrian/vehicle access to less than 1 in 20 it does not have to be treated as a ramp in terms of the building Regulations. 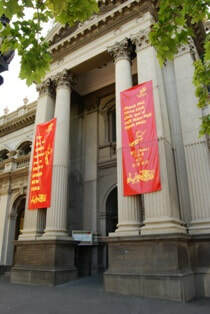 State Library of Victoria, Melbourne (DPCD) An external ramp adjacent to one side of the portico has been incorporated on the front façade to accommodate a modest change in level without significantly diminishing the symmetry of the building. 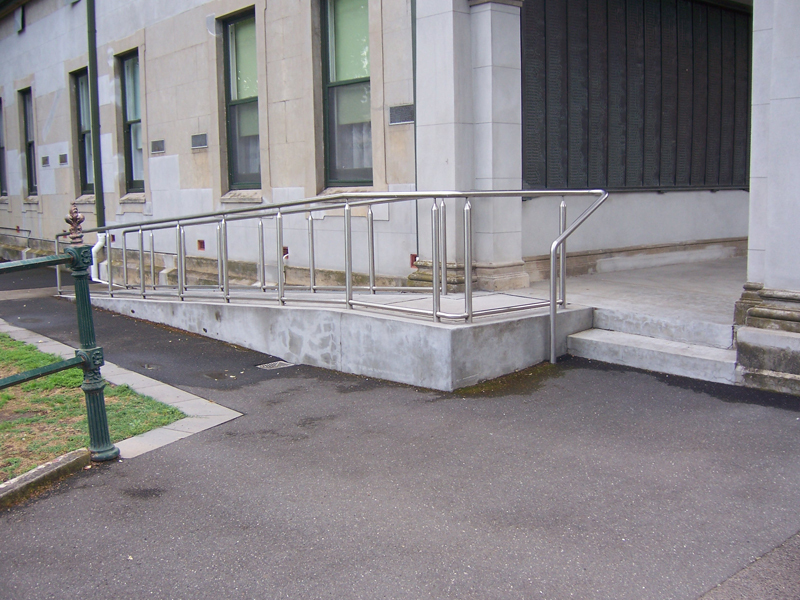 University House, University of Melbourne (DPCD) A sensitively designed external ramp and landing has been provided to the main entrance. 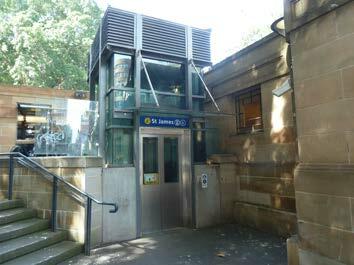 156 CLARENCE STREET, SYDNEY A platform lift and modified stairs has been installed as part of the internal refurbishment of the foyer to overcome the level difference between street and ground floor. 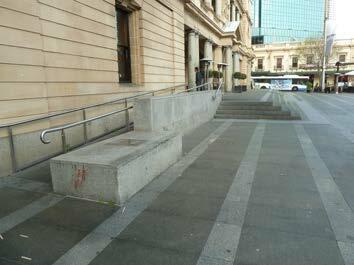 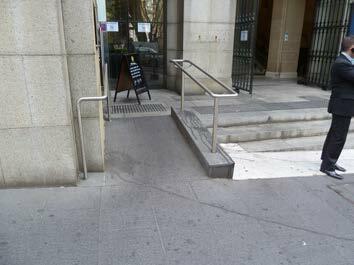 ANZ BANK, WYNYARD STREET, SYDNEY The footpath has been raised to floor level where space is available without providing excessive gradients to overcome the entry step. 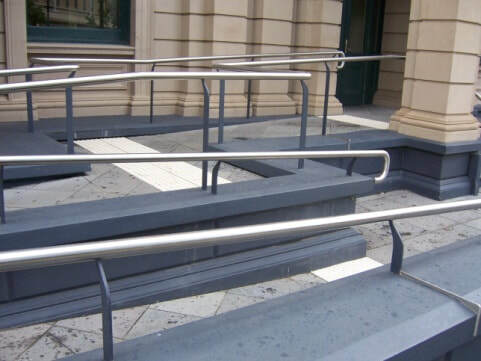 ART GALLERY OF NSW, SYDNEY A new ramp of sculptural and quality design added over the top of the existing steps provides access to the ground floor entry. 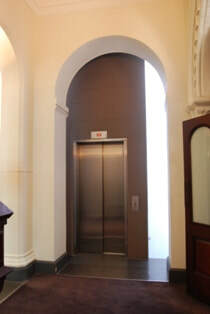 BRIDGE STREET, SYDNEY A lift has been incorporated into the existing building in a suitable and less significant space off the foyer. 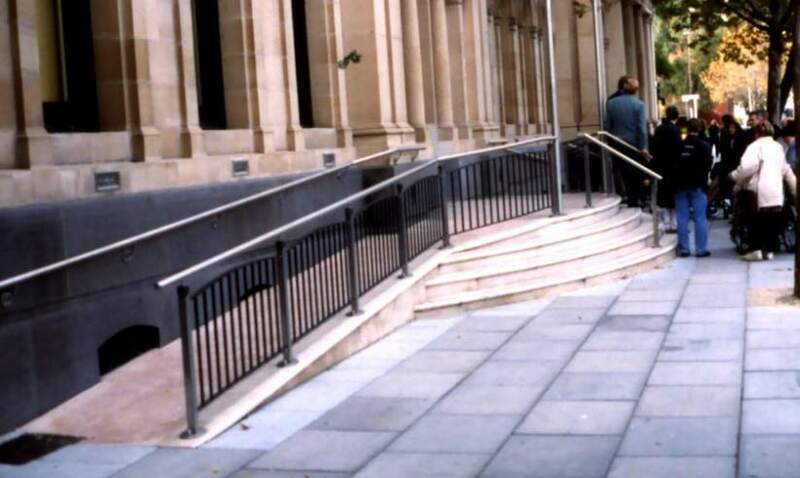 BRIDGE STREET, SYDNEY The former step has been replaced by a step ramp. 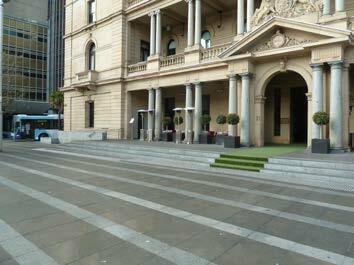 CUSTOMS HOUSE, SYDNEY New steps and symmetrically placed ramps have been constructed in front of the original building to provide access replacing steps to the portico that previously existed. 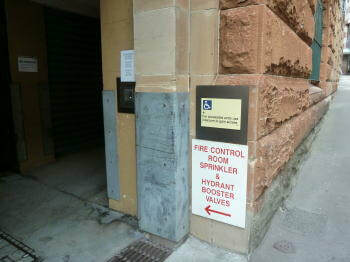 DEPARTMENT OF EDUCATION BUILDING, BRIDGE STREET, SYDNEY Signage added to indicate what and where assistance is available. 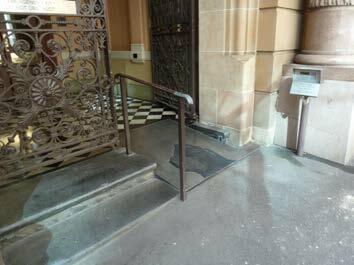 FORMER BANK BUILDING, MARTIN PLACE, SYDNEY A new entry created adjacent to the original corner stepped entry, by opening up an adjacent former window to provide direct access and internal refurbishment of ramp/lifts enable access to ground floor. 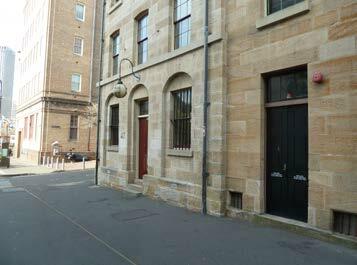 GEORGE STREET, SYDNEY Several steps right on footpath prevent access without substantial alteration of a building within a heritage precinct. 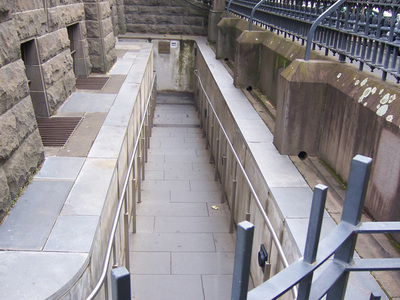 HYDE PARK BARRACKS, SYDNEY A checker plate ramp added to existing entry steps to overcome the step. 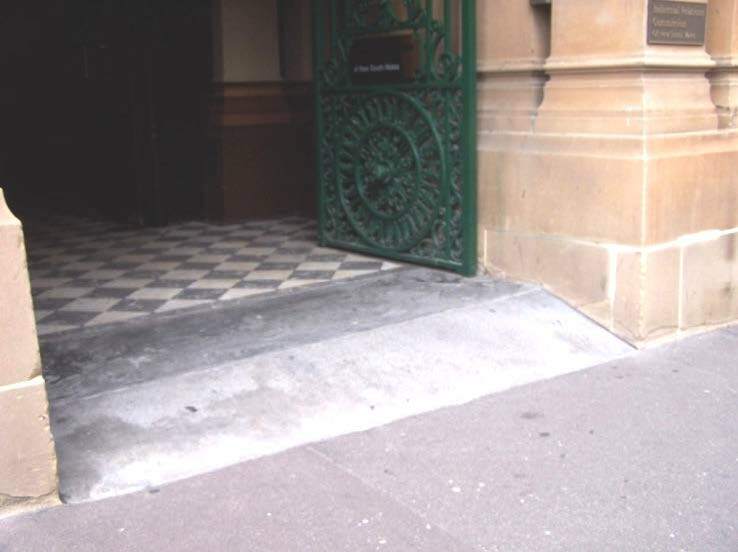 LANDS DEPARTMENT BUILDING, BRIDGE STREET, SYDNEY Part of the steps have been cut back to provide a step ramp as well as a “Call for Assistance” offered. 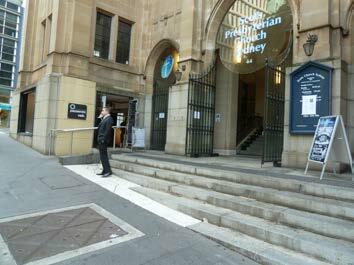 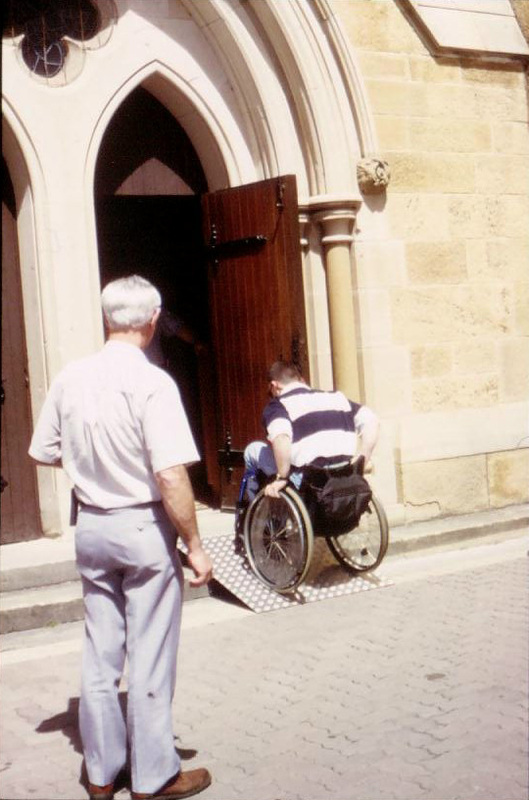 SCOTS PRESBYTERIAN CHURCH, WYNYARD, SYDNEY Part of the entry steps has had a ramp added over the top to enable access. 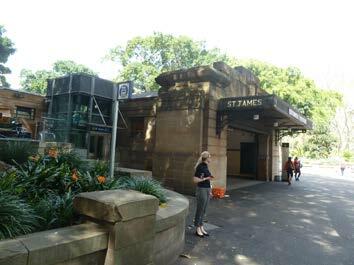 ST JAMES RAILWAY STATION, SYDNEY A new lift added beside the original and small entry, which provides access to the tunnel and entry level of the railway station. 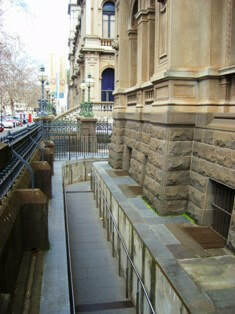 SYDNEY TOWN HALL The George Street entry has a main stair so a side access has been provided. 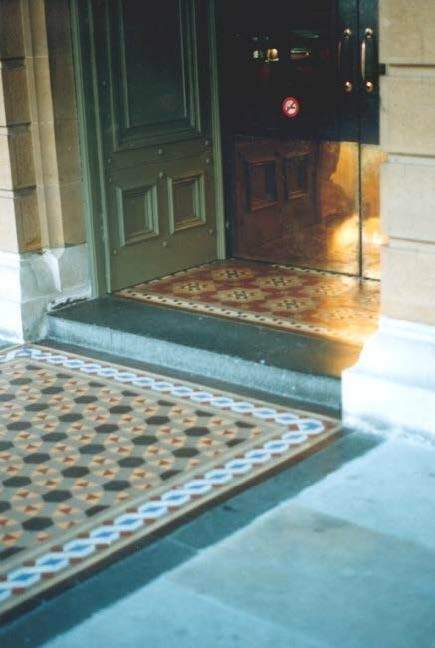 Two smaller leaves of a door have been joined together to provide one larger opening and the door automated to enable easy access. TOCAL FUNCTION CENTRE RAMP, PATTERSON NSW New ramp to former hayshed now adapted to a Function Centre uses timber to reflect rural details. 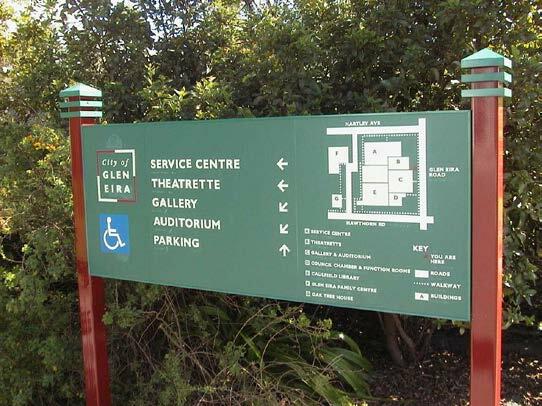 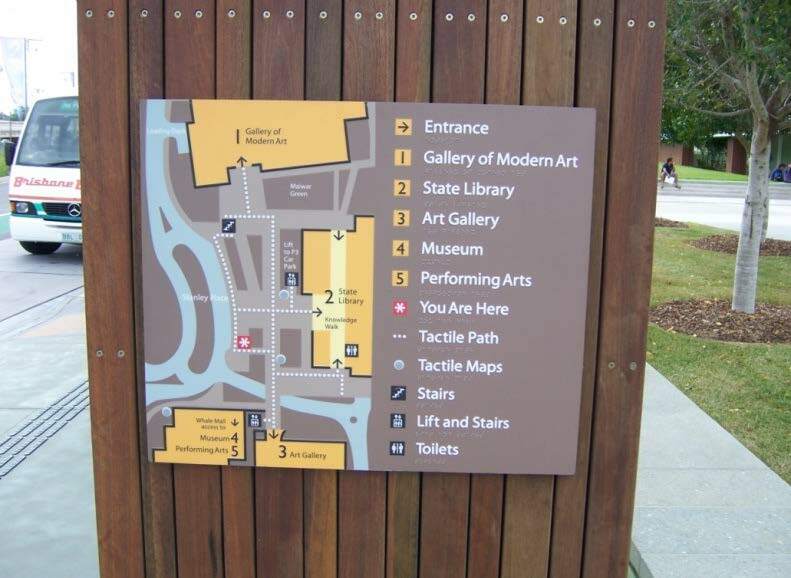 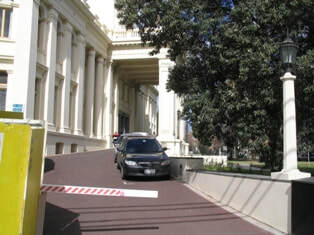 OLD PARLIAMENT HOUSE, CANBERRA, ACT Designated parking located close to main entry with complying access to the entry via an alternative entrance under the main steps. 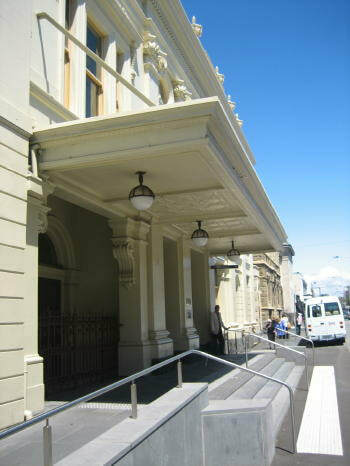 Former Fitzroy Town Hall, Fitzroy (DPCD) A new external lift adjacent to the accessible entrance from the car park provides access to all floors. Harold Holt Swim Centre, Glen Iris (DPCD) Existing (non-compliant) ramp is retained in use as part of the architectural significance of the building and a new accessible entry provided. 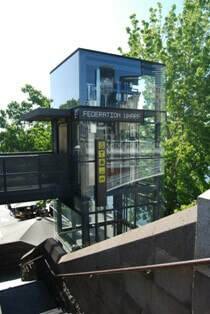 Princes’ Bridge Walk, Federation Square, Melbourne (DPCD) A contemporary steel and glass external lift has been provided to deal with a large change of level adjacent to a historic bridge and provide access to a hospitality and tourism precinct. 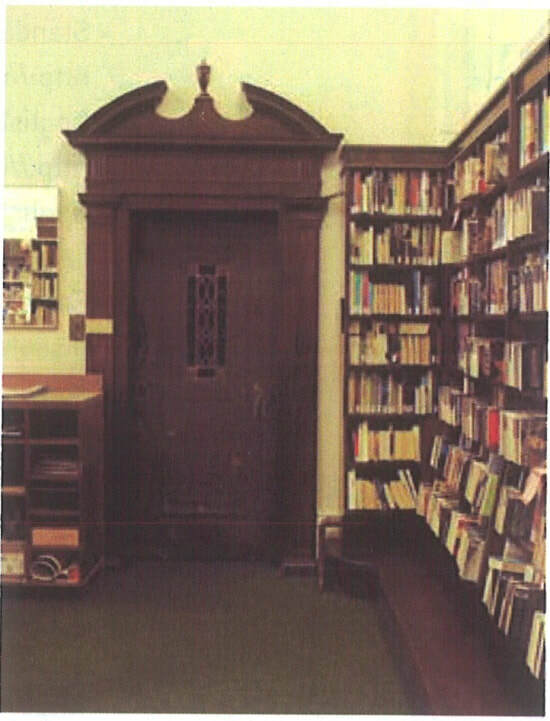 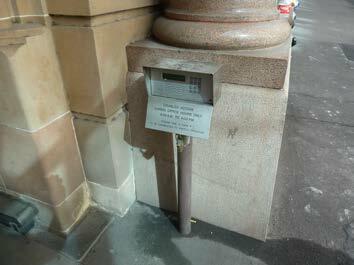 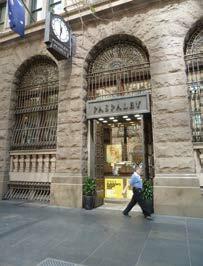 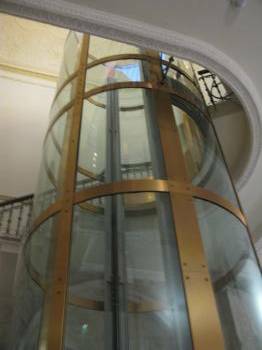 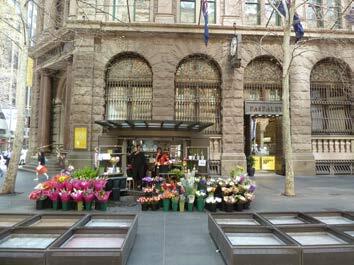 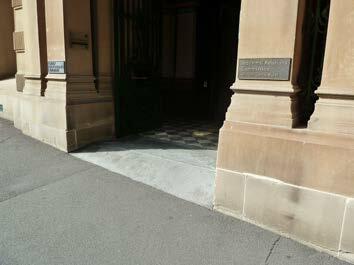 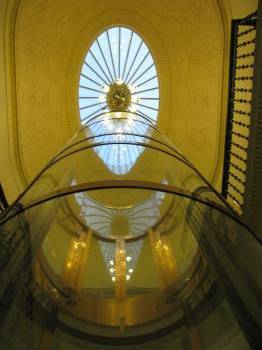 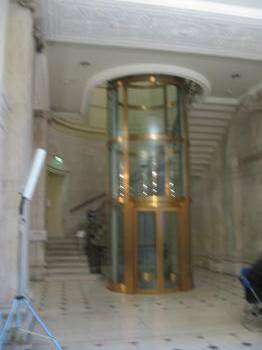 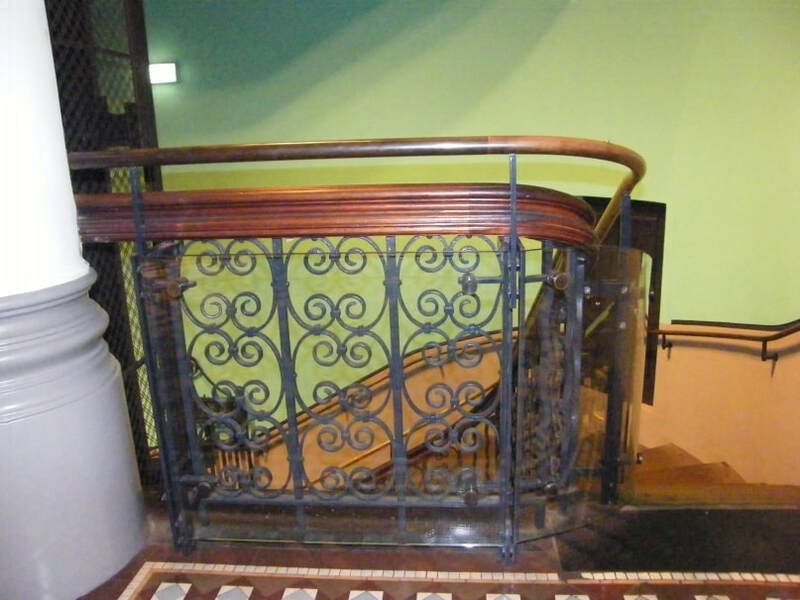 Athenaeum Library, Melb (DPCD) The historically significant lift still provides access. 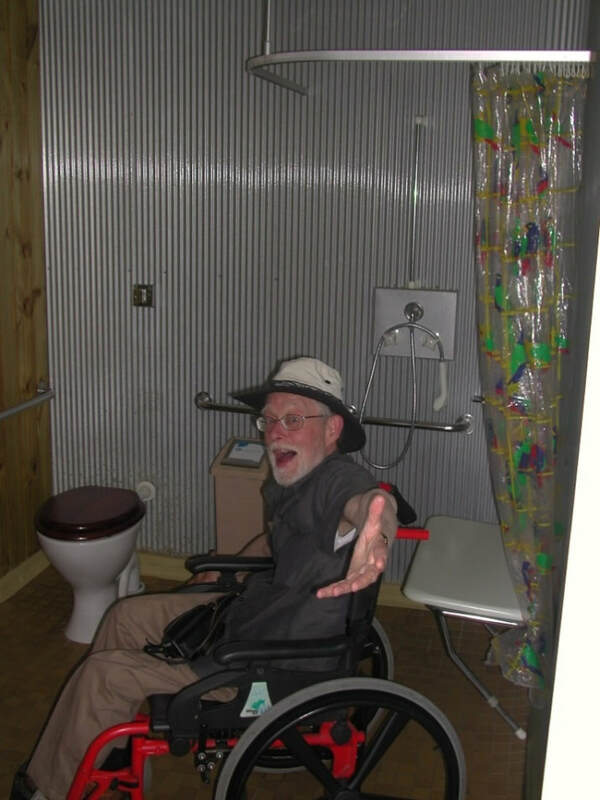 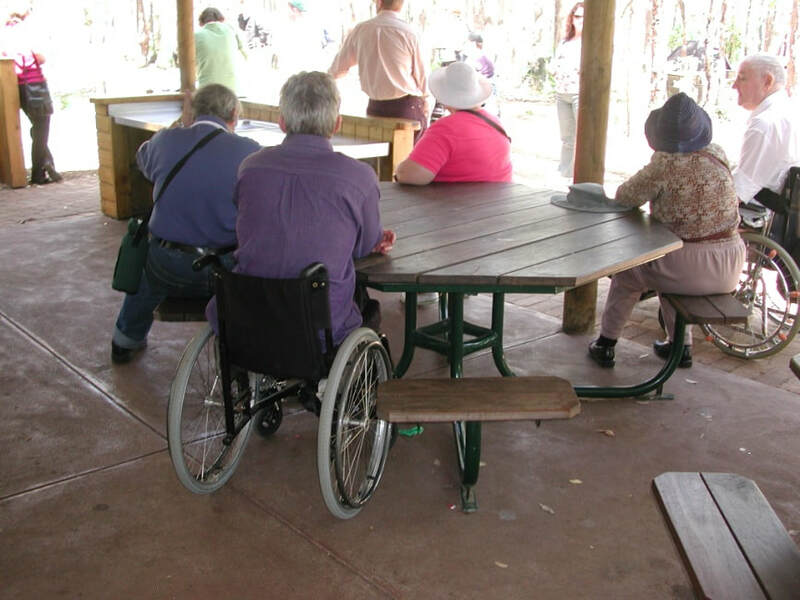 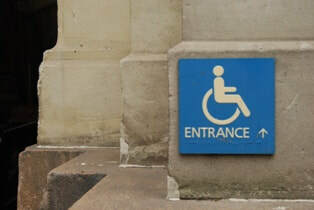 Management systems provide staff to assist wheelchair users who would find the manual doors and non-compliant controls difficult. 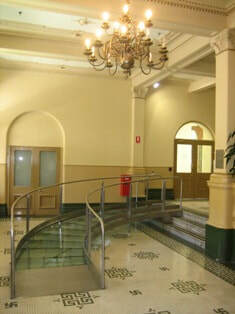 Former Magistrates Court (RMIT University) (DPCD) A new internal lift has been incorporated into the historic interior. 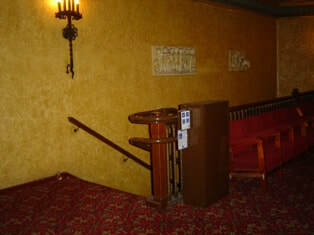 Forum Theatre, Melbourne (DPCD) A stair climbing platform is provided for wheelchair users to access the upper levels of the theatre where a lift would not be practical to install. 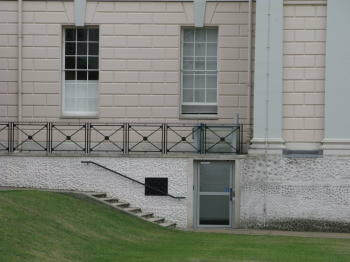 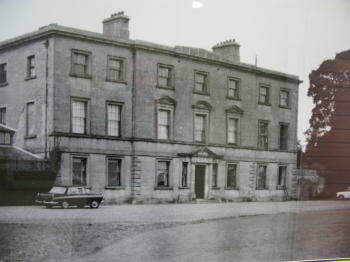 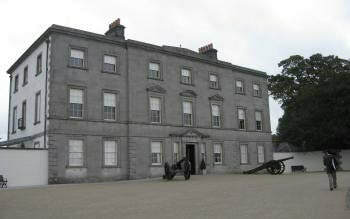 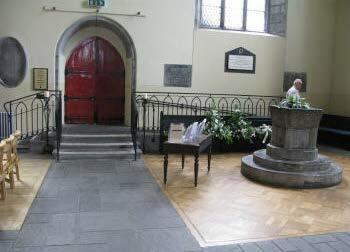 It has been painted to minimise its impact on the historic interior. 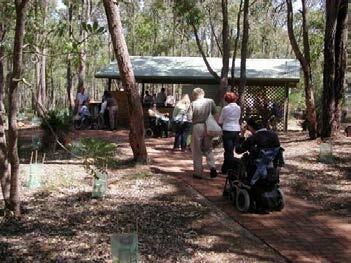 TOCAL VISITORS CENTRE, PATERSON, NSW. 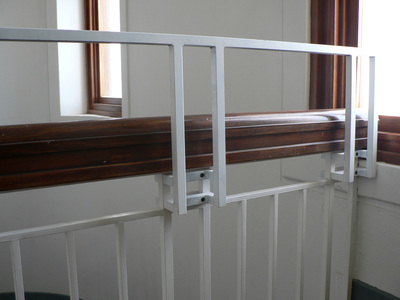 Handrail timber detail to reflect the timber detailing on the farm. YORK, UK. 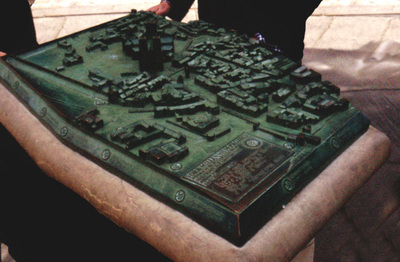 A tactile city map. 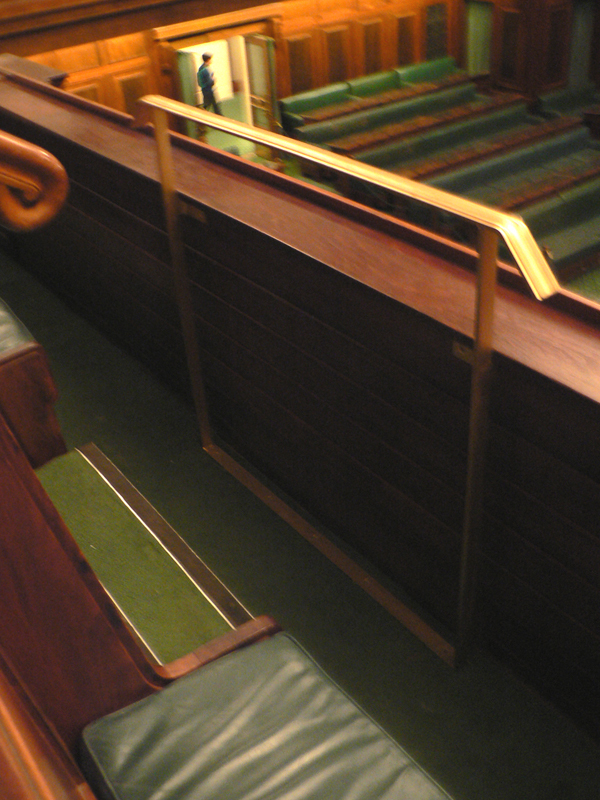 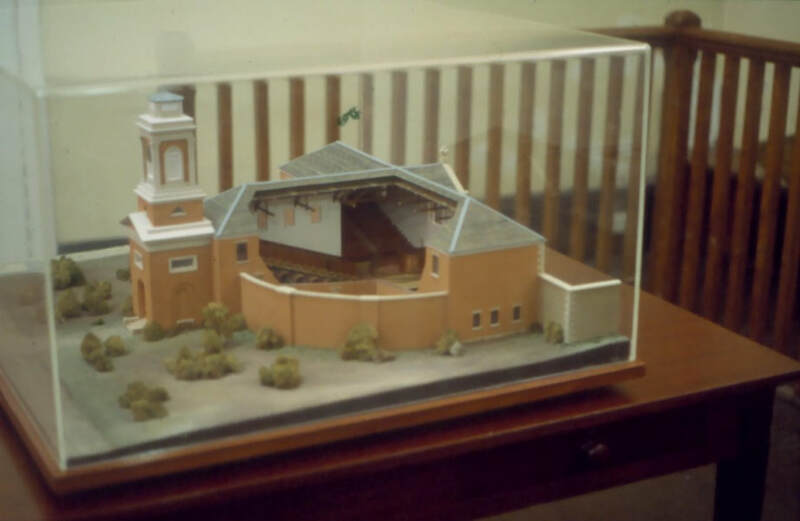 OLD PARLIAMENT HOUSE, CANBERRA. 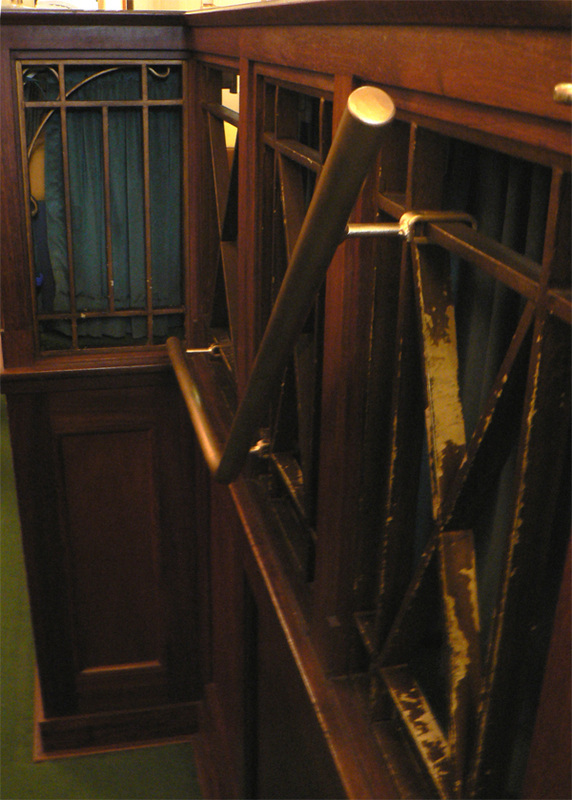 Additional top to balustrade clamped on. 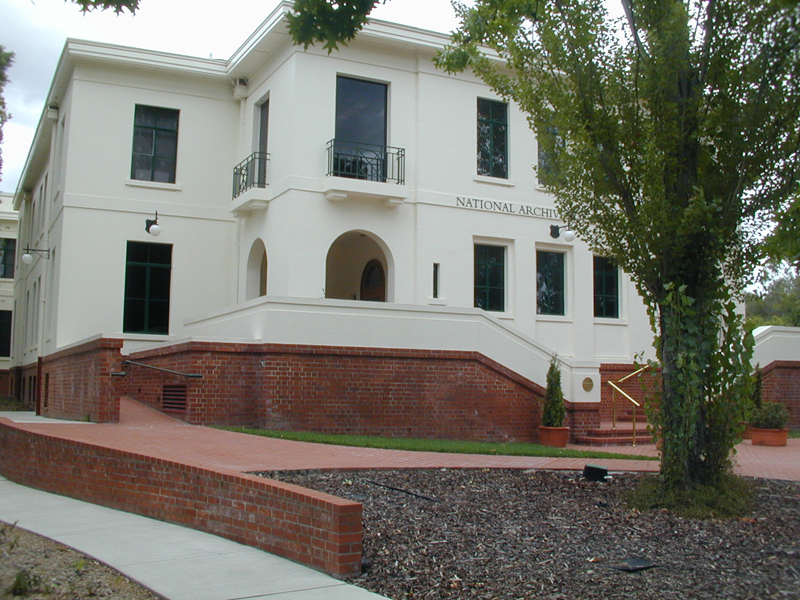 OLD PARLIAMENT HOUSE, CANBERRA. 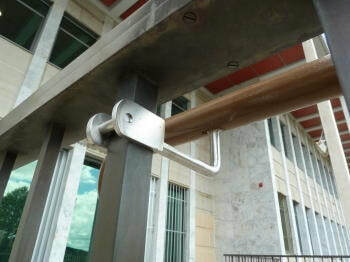 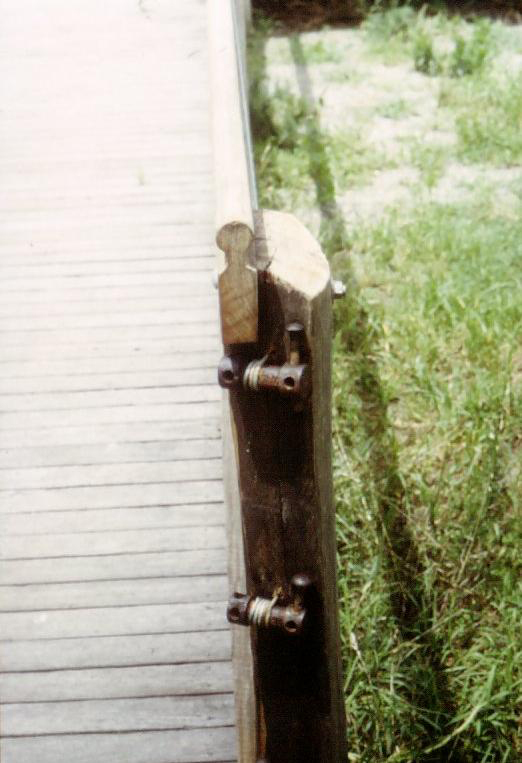 Increase in balustrade height by clamping on additional element. 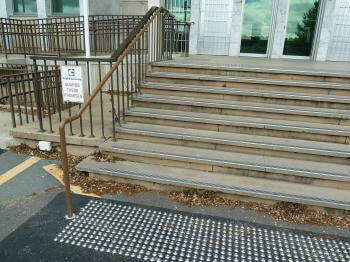 OLD PARLIAMENT HOUSE, CANBERRA. Addition of handrail by clamping on to existing balustrade. OLD PARLIAMENT HOUSE, CANBERRA. 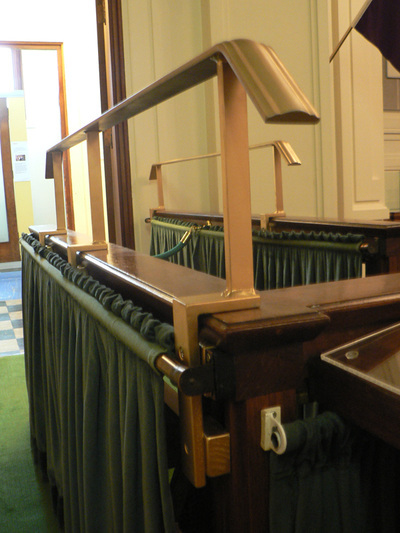 Additional bar to increase balustrade height at end of aisle. 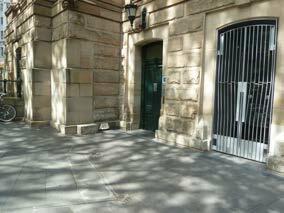 MELBOURNE GAOL, VIC. 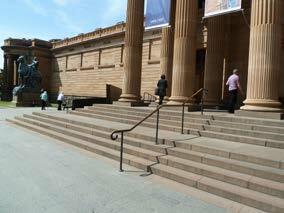 Basic interpretative information is available in 9 languages for non-English speaking patrons. 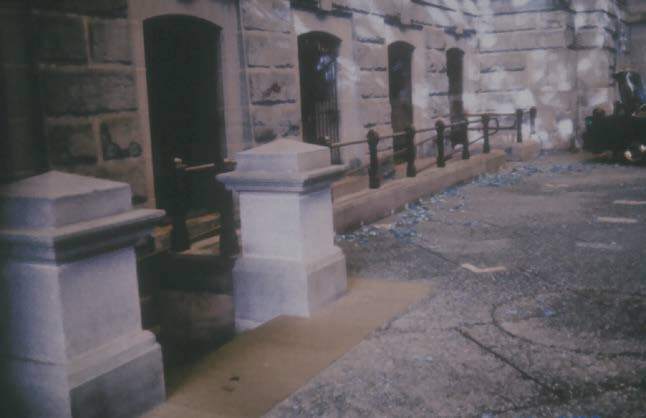 MELBOURNE GAOL, VIC. 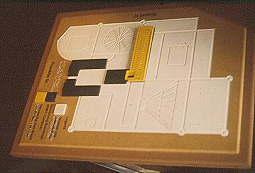 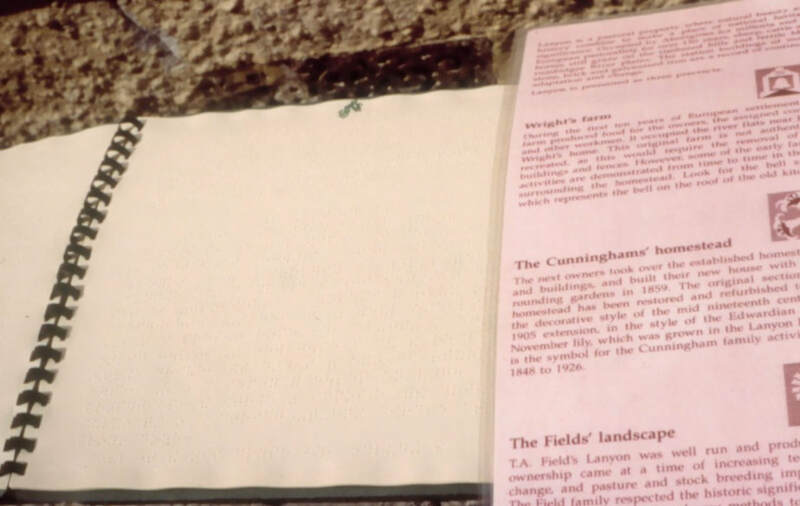 A model is colour coded and includes tactile presentation. 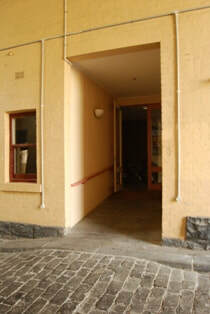 MELBOURNE GAOL, VIC. 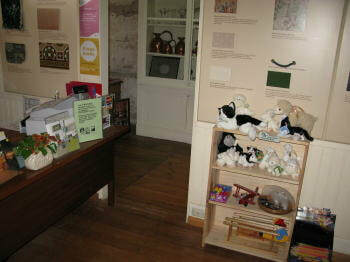 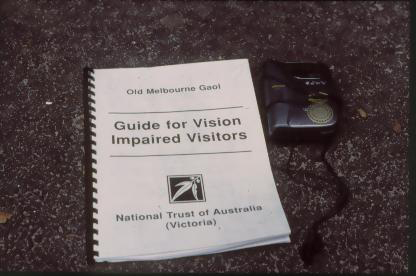 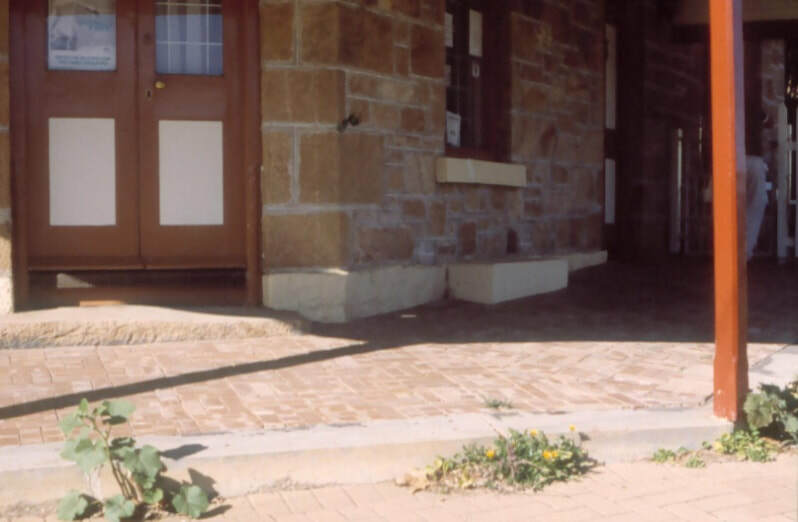 The Gaol has an extensive guide and facilities for vision impaired visitors. 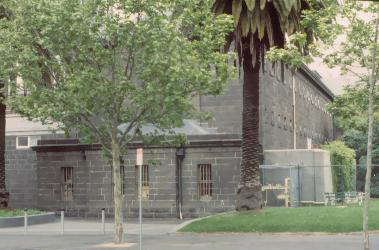 MELBOURNE GAOL, VIC. 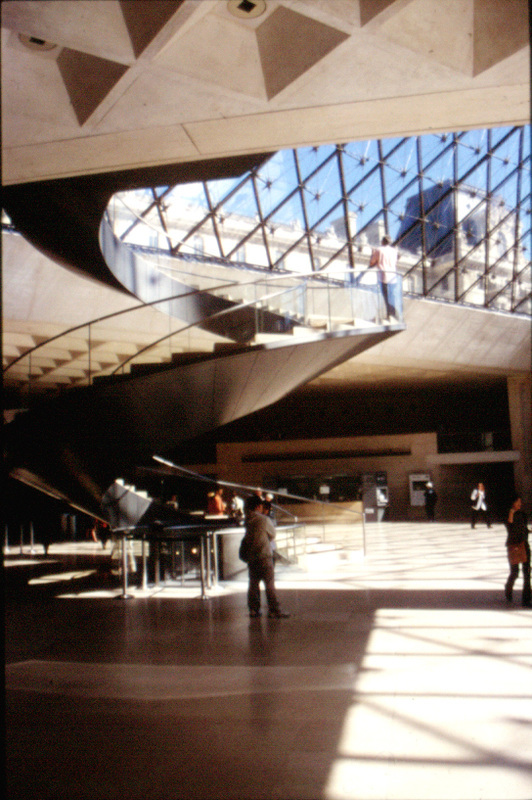 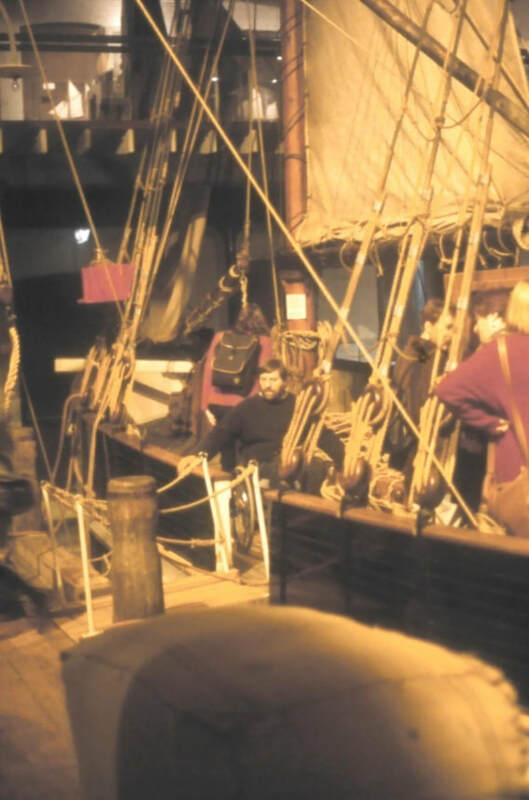 Some original objects or reproduced objects are available for patrons to touch and pick up to enable greater appreciation. 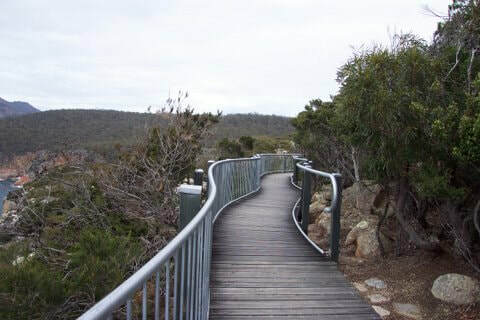 Freycinet National Park, Tasmania (Pam Enting) An accessible pathway, which does not detract from the landscape, provides access for all to the Tourville Lighthouse. 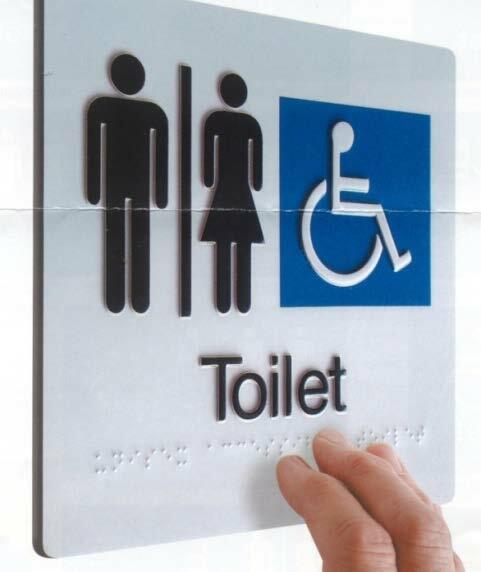 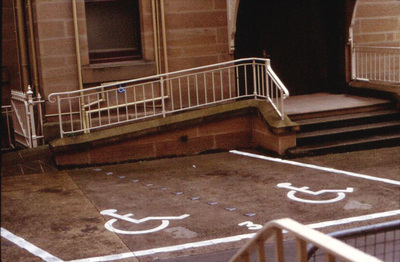 GPO Building, Melbourne (DPCD) Signage is used to inform wheelchair users and parents with pushchairs of the accessible entrance. 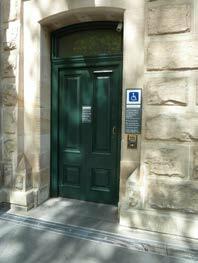 Immigration Museum, Melbourne (DPCD) New accessible WC facilities can be integrated into existing spaces within an historic building. 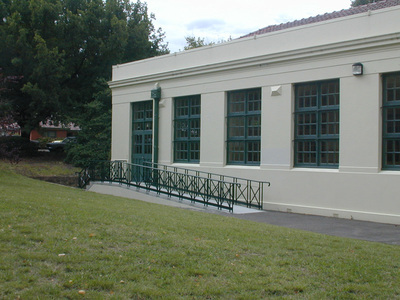 MAITLAND ART GALLERY A new building adjacent the original heritage listed building has enabled access to be achieved into the original building. 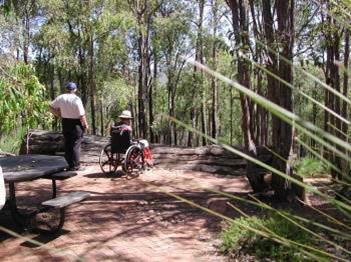 MUNDARING WEIR, WEST AUSTRALIA Complying ramps or even lifts can be provided to access key vantage points, such as a lookout or site of significance. 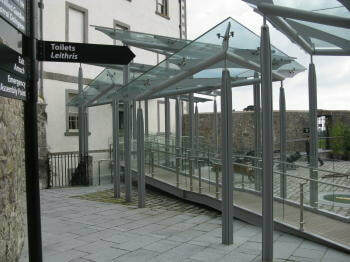 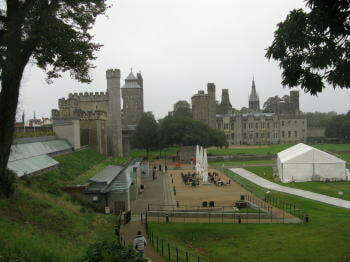 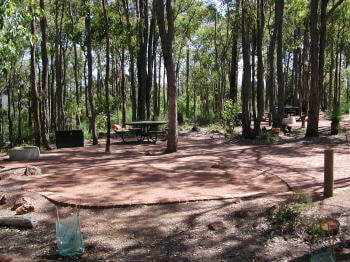 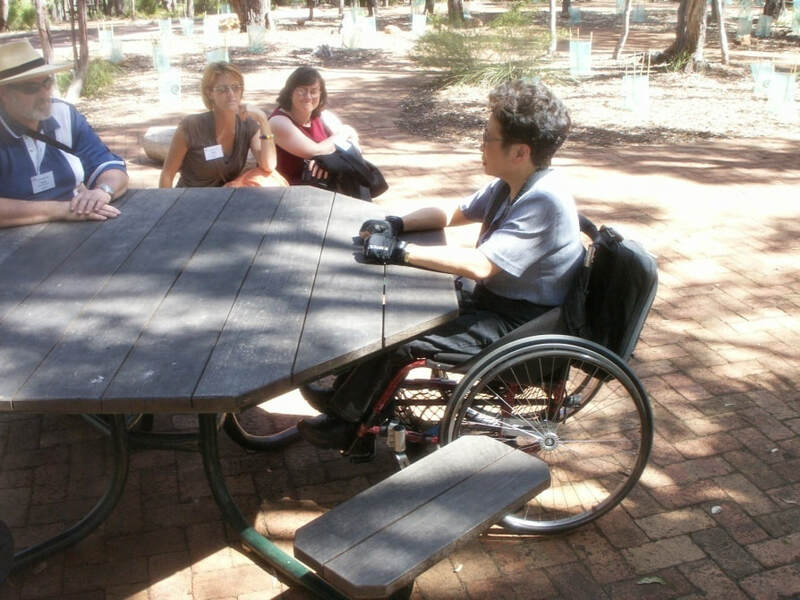 They can be designed with suitable materials such as timber and stone to blend with the site and still be accessible. NEWCASTLE MUSEUM The conversion of the former Railway buildings with some new structures enabled access to the whole building. 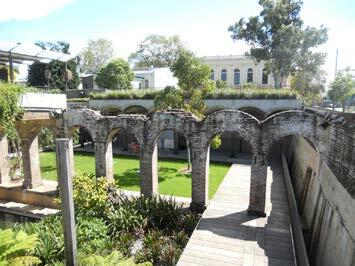 PADDINGTON RESERVOIR The former reservoir was converted to a public space which includes access to all areas. 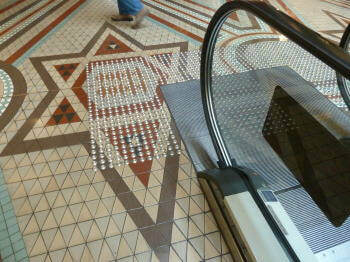 QUEEN VICTORIA BUILDING, SYDNEY Discrete tactile indicators added over patterned mosaic tiles at an escalator. 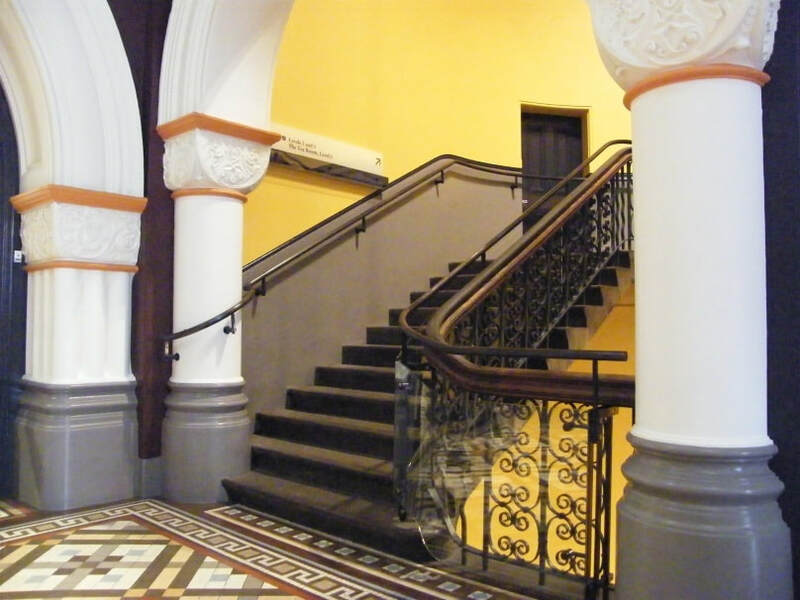 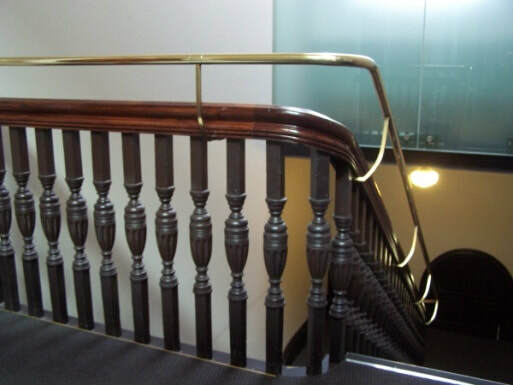 QUEEN VICTORIA BUILDING, SYDNEY A new brass handrail and glass balustrade added in front of the original balustrade. 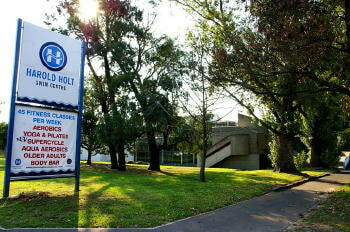 AINSLIE PUBLIC SCHOOL Canberra. 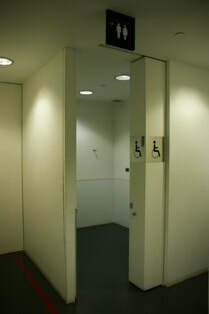 Doors are automated to swing open. OLD PARLIAMENT HOUSE, Canberra. 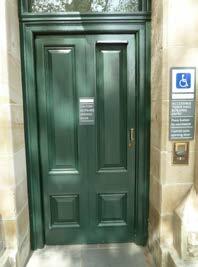 Door is automated with a button to activate it.